If you’ve vented about a boss to a Harvard Business Review-loving friend, you’ve probably heard that phrase. But what does that really mean? Why is it important? And what does it look like in a school? First off the importance. According to Psychology Today, Gallup polling reveals that the number one reason people quit their jobs is a bad boss. That’s where managing up comes into play. 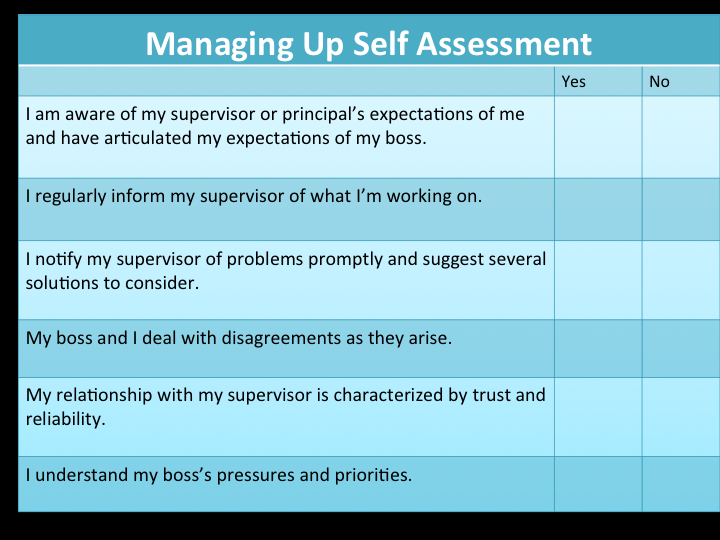 Managing up means working proactively with your boss to influence his/her decision-making in a way that helps your school, your manager and you reach all your goals. How do you do in a school? Take this self assessment and then try out one of these quick tips. 1) Be proactive. Walk into every meeting (whether it’s a staff meeting or one-on-one) with an idea about what you would like to accomplish. Think what outcome would be most valuable to reaching the goals you have set out. 2) Think with your supervisor. When dealing with a problem, help your supervisor think through the best solution. This might mean coming with a prepared solution for him or her to review or even coaching him/her through the decision-making process. 3) Communicate, communicate, communicate. Be aware of your boss’s preferred communication style and perspective on any given issue. Communicate often in a way that honors both. Provide frequent updates about your work – both successes and challenges. Try it out! And let us know how it goes.